Hello Northeast Minneapolis car owners - with this winters weather today we're talking about suspension integrity. Your skeleton provides the structure to hold up your weight. Your joints cushion you as you walk and allow you to change direction. 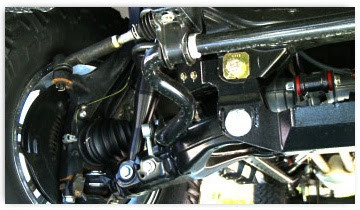 Your family car’s suspension system is similar: It bears the weight of your vehicle, absorbs bumps in the road and controls the body as you steer. Like the bones in your body, family car suspension parts are connected by joints that allow all the components to move as they should. Over time and miles, the joints start to wear and your suspension gets loose and doesn't operate as precisely as before,reducing proper tire contact with the road. An accident, pothole or hitting a curb or rock can also damage or break family car suspension components. If you've ever hurt your foot, you know you've had to walk differently to keep it from hurting as bad. Do that long enough and your ankle, knee, hip and even your back will start to hurt from the strain of not moving normally. The same thing happens in your family car when one joint or part is worn or damaged: it stresses everything else and causes premature wear to the whole system. Signs of suspension problems include uneven tire wear, vibration, rattles or clunks when you hit a bump or turn on a windy Saint Paul road, or the vehicle pulls to one side. If you suspect a suspension problem, ask your cheerful Mr Tire Service service specialist for an automotive analysis of your suspension system. They can also check your alignment while they’re at it. Taking care of a worn or damaged suspension component early, will head off future damage and costly repairs down the road.